We have collated a number of these scientific reports and research papers which can be viewed below. The red-finned blue-eye is the only pseudomugilid fish known from inland Australia and it is found only within an isolated cluster of Great Artesian Basin springs on Edgbaston Reserve in central-western Queensland. Surveys conducted in early 2009 revealed that red-finned blue-eye was present in four individual springs and that invasion of the spring complex by alien eastern gambusia was the most likely factor contributing to local extirpations. A three-year project commenced in the same year, with the twin aims of investigating methods for removing gambusia from springs and relocating small populations of red-finned blue-eye to fish-free springs. Gambusia removal with rotenone has been successful in a trial spring at Edgbaston and aquatic invertebrates have not been adversely affected. From a total of seven relocation events conducted in the same period, red-finned blue-eye populations have persisted in three. The results indicate that gambusia removal and red-finned blue-eye relocation are both suitable methods for red-finned blue-eye conservation, and as the fish is both endangered and declining, these methods and other strategies such as captive breeding should be implemented to prevent species extinction. In 1984, the then SA Department of Environment and Planning commenced a comprehensive review of the significance of the 4000 plus GAB vents and springs in SA covering Aboriginal heritage, European heritage and biodiversity features. This culminated in the production of the 1986 report, “Heritage of the mound springs”. Based upon this work, the Department identified ten springs as a priority for fencing and protection. Using a mixture of State, Commonwealth and industry funding, the GAB springs at Blanche Cup, The Bubbler, Strangways, Big Perry, The Fountain, Twelve Mile, Outside, Tarlton, Old Nilpinna and Big Cadna-Owie were fenced during the period 1985 to 1988. At the time of this fencing, the Department of Environment and Planning commenced a monitoring program to assess the effects of the stock exclusion etc. The monitoring also included an unfenced spring, Little Bubbler, near The Bubbler and Blanche Cup to provide information on the condition of a spring still accessible to stock and other introduced animals. In the early to mid 1990s, pastoralists S Kidman and Co offered to relinquish a portion of the Stuart Creek pastoral lease – areas including and surrounding Blanche Cup and the Bubbler – to be included in the national parks system. These negotiations succeeded and Wabma Kadarbu Mound Springs Conservation Parks was established in 1995. This included Coward Springs, Little Bubbler and other springs within the immediate environs of Blanche Cup and The Bubbler. In the late 1990s, the new lessees of Stuart Creek, Western Mining Corporation, offered to relinquish a much larger area surrounding Wabma Kadarbu, to protect many other springs including Jersey, Elizabeth, Horse, Buttercup and Mount Hamilton springs. These negotiations were also fruitful and the expanded Wabma Kadarbu GAB springs Conservation Park was proclaimed in 2001. The springs listed above have been monitored annually since their fencing. Coward Springs was included for monitoring with the initial dedication of the Wabma Kadarbu Mound Springs Conservation Park. At the time of the initial fencing program in the 1980s, the Department engaged Dr Tim Fatchen to design a monitoring program. At that time it was envisaged that pastoral lessees and possibly others resident in the region could be engaged in assisting with monitoring. The focus of monitoring has therefore been the following: photopoints; recording of plant species present; some measurements of pool diameter and extent of fringing vegetation; and some transects to show distribution of dominant plant species from vent to wetland. 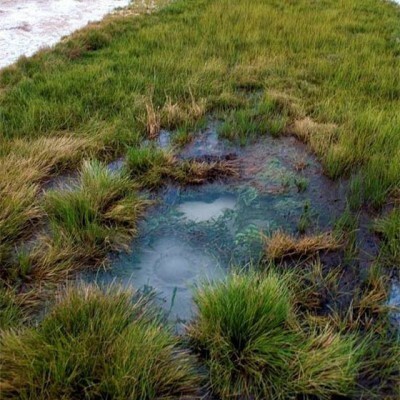 The GAB springs fencing program and the resultant exclusion of stock and other animals has led to a substantial increase in the biomass and, in some instances, area of wetland vegetation as well as associated dryland vegetation. In some cases a relatively stable situation appears to have developed ( e.g., Blanche Cup, Bubbler, Little Bubbler and, to some extent, Old Nilpinna). In other cases there has been a proliferation of reeds, Phragmites and/or Typha, which appear to have stabilised in terms of cover (sometimes because they now comprise 100% of wetland cover) but which now wax and wane in terms of condition and biomass (e.g., Big Perry, Fountain, Outside, Big Cadna-owie). At two other springs (Twelve Mile and Coward Springs) the spread of Phragmites is continuing. At Tarlton there has been a proliferation of Typha through the 1990s, followed by a decline in spring flow and death of Typha – with the most recent observations, in 2004, suggesting that the springs may be about to dry up completely. At the fenced spring at Strangways, there has been a steady decline in pool vegetation and apparently spring flow at the fenced spring during the last five years. The proliferation of Phragmites and/or Typha has created concerns including: the loss of open pools and the reduction in plant diversity, potentially adverse effects on aquatic fauna, particularly the significant hydrobiids (freshwater snails), and the potential for the dense growth to reduce spring flows through increased evapotranspiration and possibly through plugging of the spring vent. Reflecting these concerns, active manipulation of the reeds, on a carefully monitored trial basis, is recommended at selected springs. This work will need to link with burning trials elsewhere (e.g., on Finniss Springs). The Great Artesian Basin lies under one third of the landmass of the continent of Australia. It is the most significant body of fresh water in Australia and as such is of extreme importance ecologically, geologically and economically. Befitting the in1portance of the Great Artesian Basin (GAB) there exists a large body of literature relating to this topic. Much of this literature is "grey literature" and difficult to obtain. The term grey literature refers to unpublished reports, manusripts and theses etc. It is also often difficult to access literature through existing databases as most of them are subject specific (i.e. Biological Abstracts, GeoRef). Previous attempts have been made to document GAB literature but they have been limited in their scope. The Mound Spring Researchers Forum published a mound spring bibliography that was updated after each meeting , however it was primarily focused on biological literature. 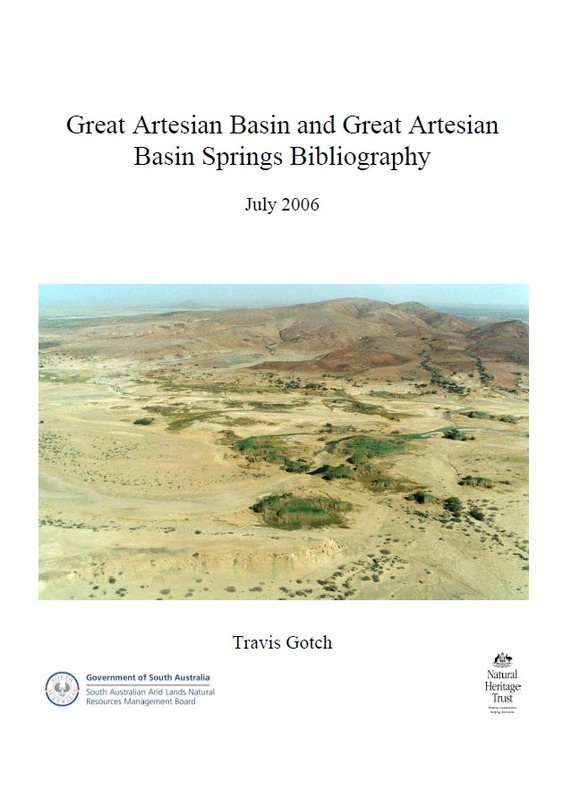 The Great Artesian Basin Consultative Council (GABCC) funded the development of a web based bibliography that while useful in concept did not capture much of the available literature. The purpose of this bibliography is to capture as much of the available GAB literature as is possible and to present it in a searchable database on a DVD. We also intend to include PDF reprints of as many unpublished reports as we can (copyright issues not withstanding). Presented here is the current bibliography, it is expected that the number of references included will grow further as more references come to light.